I’d like to say a word about the role that the Bedouin warriors play in the story, including the proud Tuareg leader, Haidar. Some readers have expressed a concern that it might be politically insensitive to portray Arab people as being “the bad guys.” The emotional tenor of our times, the fear of radical Islam and the terrorist tactics that a few misguided Muslims engage in, and the hurt many Muslim people feel as a result of the political turmoil, could well create a negative reaction to the fact that Zinovy has enemies who are Arab. I would be so sorry if anyone reading this book were hurt by my portrayal of some of the antagonists as Arab Bedouins. A thoughtful reading of the story should allay those concerns, however, on several fronts. First, it should be noted that the primary antagonist in the story is not an Arab, and the primary evil does not come out of a Muslim theology. Adam Hamilton is an American—a well-educated, civilized, rational, polite and considerate individual who is evil to the core. If any cultural influence is to be blamed for the evil in Adam Hamilton, it is the western postmodern worldview that claims to be tolerant but is, in fact, hideously intolerant of any opinion which disagrees with the core values of secular humanism. If anyone has reason to take offense at my portrayal of the enemy in this story, it would be those who adhere to the politically correct ideas about right and wrong, truth and error that our postmodern worldview currently embraces. Second, as the book points out, no religion has survived the purge of the Global Regime in this futuristic political setting. All major religions were eradicated because of their intolerance and the divisiveness that came out of their determination to hold on to their own conflicting perceptions of “truth.” So, though some of the enemies are Bedouin warriors, none of them are Muslim. In the absence of other religious influences, the faith of these young soldiers has reverted to an ancient tradition that is grounded in superstition and a fearful respect for things they cannot understand or explain in nature. This, I believe, is a credible premise. Any human culture from which the tenets of revealed truth have been removed will revert to this kind of uneducated and simple belief system in the end. If these statements are considered a defense of the way I’ve portrayed the enemy, there is another strong argument that no creed or culture is being faulted by the story. One of the characters Zinovy meets along his journey is the great Tuareg Bedouin leader who has been left to protect his community after the young men abandon their homes to follow the Regulus movement. This Tuareg patriarch is one of my favorite characters in the book. He represents the best of the ancient and proud Middle Eastern tradition. This is a tradition that gave the modern world a wealth of scientific, mathematical, literary, and artistic learning at a time when Europe was lost in the abyss of “the Dark Ages.” This Tuareg character, who has yet to be given a name, is so admirable I’m almost tempted to write another novel and make him a major player in the story. Almost. 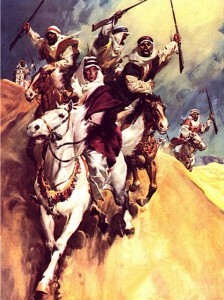 The Bedouin warriors portrayed in the image on this page are part of that same great tradition. No, they are not necessarily heroes. They are human beings who fought brutally for things they wanted; who often allowed themselves to be ruled by negative passions; who lived selfish lives in league with other selfish people in their tribes and families. In short, they were human beings just like us. As such, just like us, they are interesting, exasperating, in need of redemption, and greatly loved by their Creator. Human beings like this make great characters in novels. Our answer to that question will determine our eternal destiny. It will conclude the plot of our individual stories, and forever put to rest the most significant conflicts in our lives, for better or for worse.